Crash Friend’s Browser By Sending Easy Link: Hello Guys, I am back again with one of the most interesting trick for Broke Friend’s Browser, in this post Today i will share a method, in which you can crash your friend’s Mobile Phone or PC, By Just sending a Normal link to them. Which Will crash your friend’s Pc / mobile. As soon as he / She open Link, which is given below. Previously we were shared post about Android Network Snoofer app, for make your Android app spoofing and which is also a very good way for prank with your friends. There are so many ways to make fun of your friends, and prank with your friends. You can Simply Make your friends crazy, by sending them a link, Which will crash their browser instantly. Also know How to Replace Kingroot With SuperSu and Create Free Virtual Credit Card for Payment. This trick working in so many browsers Including Windows, Linux, Android, iPhone, Mac Etc I know because, I have tested in many Browser. 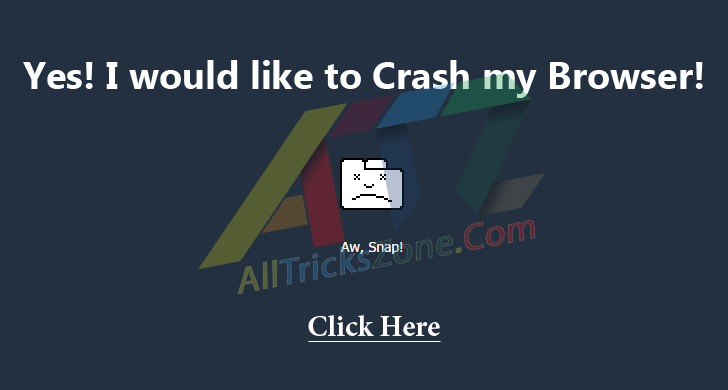 With the help of this article you will know Trick to Crash Browser which work in almost all browser, You just need to use this Browser crashtool Link to make fun of your friends. At last your Friend’s need to Re insert Battery in Phone or They need to wait for sometime. This Guide is working in Many Browser Including Linux, Windows, Android, Symbian, iPhone, MacOs etc. I have tested this on So Many Device and this Prank trick is working fine till yet. With help of this link, you can make fun of your near friends or anyone as well long distance. Previously, We was also shared Guide about How can you Crash Friend’s Whatsapp Account by Sending simple message. Just you have to share this link with your friends. When they open this link in their Device, their browser will start Hanging Automatically. and in some cases, if your friends are using low-end device, with 512MB RAM or less, their phone will also will be Stuck and they need to re-insert the battery in Phone. So now have a look on more about this easy Guide now from Below. In this Link, Developer Ravi Prakash Singh have added a Loop for, Because of that loop, This script don’t have any end. So, it will run continuously. and when a script run continues, it cause browser to hang, and sometimes devices may also hang. So this is the Main Login of this programming, which we have used in this Guide, and you will be able to prank with your friends by crash their browser easily. Also Read How to Wake Up Android With Volume Button and Send Unlimited Anonymously SMS to anyone. So I suggest you must check it out at least once for fun which crash anyone’s pc with just simple Link. Check it out How to Bypass SMS Verification and Fake Indian Disposable Phone Number. And Almost after 1 Minute, Their Browser will again start to responding, Now your friend can close this link and recover browser. And in some cases If Browser still Crashing and not responding, then need to restart phone or Pc normally, then Browser will work like before normally it works. Warning: This Easy Guide is for fun Purposes only, Misuse of this link can causes trouble for you May be your friend will be angry, So try it at your Own Risk Only. That’s it if you simply wants to crash your friend’s PC then this article is absolutely for you. Simply send this link to your friends and their pc will be crashed. That’s it guys this was from one of the best easiest way to crashing your friend’s browser, by sending a Very Simple Site link. I hope you will like this Tutorial for sure. With this link, your friend will think that you are a very techy person. So you can also know How to be a popular on your friends eyes 😀 .By prank with them with easy tricks. I have also shared some other cool Android Tricks Along With Pc Tricks, So you must check them out right now and Feel free to comment in below section, if you have any issues regarding this article or easy Guide of How can you crash your friends browser Thanks and visit again for cool trick like this.